We’re on to day 3 at the Texas Swimming Center, and the first three sessions have been barn-burners. Pool records have fallen in every single event so far – and that trend could continue today in the busiest prelims session of the week. It’ll be six prelims swimming events this morning plus the 3-meter dive qualifying. In the 400 IM, it’s Abrahm DeVine going for his second-straight national title. He’s also chasing a Chase Kalisz pool record: 3:34.50. DeVine was 3:35.2 last year, but saved his best stuff for the final. Michigan’s Charlie Swanson is the only other returning A finalist and the top incoming seed, with Cal’s Mike Thomas on his heels. In the 100 fly, Vini Lanza of Indiana is the top returner – he was third last year behind two seniors. He’s the second seed behind Michigan’s Miles Smachlo – but watch out for returning A finalist Ryan Hoffer, who seems to be on a tear for Cal after winning the 50 free last night. The 200 free should be a blast – it’s perhaps the most hyped showdown of the meet. Townley Haas is looking for his fourth-consecutive national title, and to take back the American record that Dean Farris broke on Wednesday night. Meanwhile Cal’s 200 IM champ Andrew Seliskar is the top incoming seed at 1:30.86, and he went 1:30.1 from a flat start on the 800 free relay Wednesday. (Farris isn’t swimming the event, instead going after the 100 back). In the 100 breast, we’ve got American record-holder Ian Finnerty seeking his second-consecutive title. He was a tick off the fastest relay split in history last night, splitting 49.60 on an Indiana relay that was the second-fastest in history. He’s joined by two more men who split sub-50 last night: USC’s Carsten Vissering (49.91) and Minnesota’s Max McHugh (49.97). The 100 back features Farris in the third seed, leading the first circle-seeded heat. NC State’s Coleman Stewart is the defending NCAA champ and the top seed, and he’ll lead the final heat. Grand Canyon’s Mark Nikolaev should also be in the hunt as the leader of the other circle-seeded heat. And keep an eye on John Shebat, who is the fourth-fastest in history in the event, though he wasn’t healthy most of last year. And finally, there’s the 200 medley relay. USC won last year but lost three of its four legs, leaving things wide open this year. Alabama comes in with the fastest time this year by two tenths, but it’ll depend on whether backstroker Zane Waddell can once again challenge Ryan Murphy’s fastest backstroke split in history (he was 20.22 at SECs; Murphy went 20.20 in 2016) – so far, Waddell has been well off his best times. NC State can pretty much use its best swimmers on both remaining relays, with Coleman Stewart already sitting out the 200 free relay and Justin Ress the 400 medley. 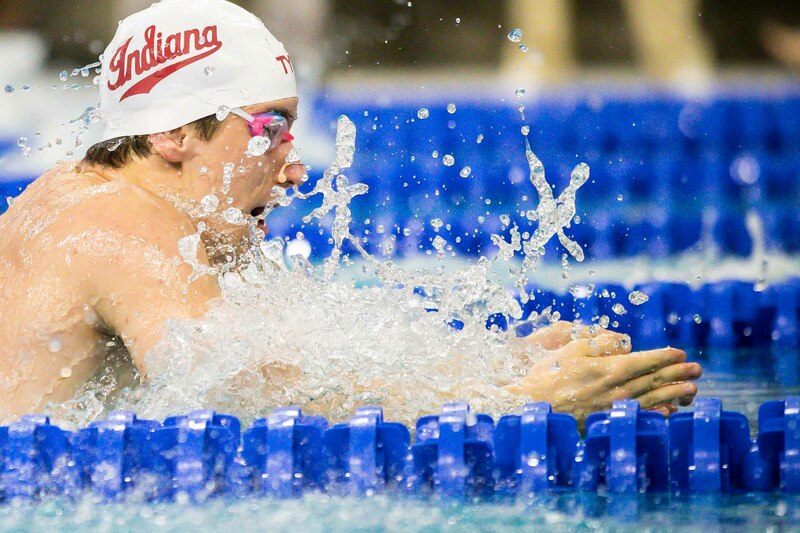 Indiana should be in the mix after their dominating 400 medley win last night, and Cal (2nd last year) should also be a strong contender, if they can get a sprinty enough breaststroke split. And don’t count out the home team – the Longhorns have a number of lineup options but should be strong contenders with breaststroker Charlie Scheinfeld swimming great and filling the Longhorns’ big hole last season. Defending champ Abrahm Devine of Stanford blasted a 3:38.53 out of a non-circle-seeded heat, and that time stood up as the best swim of prelims, even through the circle seeds. In what is usually a pretty strategic event in prelims, Devine had to judge his pace off a heat much slower than him – usually, the accepted strategy in a prelims 400 IM seems to be doing what it takes to win or finish high in a circle-seeded heat, while saving at least something for finals. We’ll see exactly how hard Devine had to go this morning for that 3:38.53. Also coming out of that heat was Cal’s Trenton Julian, who went 3:40.14 and made the A final in 5th place. Virginia had a nice morning in this event, and Brendan Casey won his circle-seeded heat in 3:39.02 to qualify second overall. Cal swept spots 3 through 5, with Sean Grieshop (3:39.64) and Mike Thomas (3:39.70) getting under 3:40. Julian was just on the other side of that barrier. For Grieshop, that’s a lifetime-best – he’d never been under 3:42 heading into this season, went 3:41 at Pac-12s and now 3:39 this morning. Thomas, too, dropped a tenth from seed. Penn’s Mark Andrew won the final circle-seeded heat to qualify 6th, with Arizona’s David Schlicht and Florida’s Kieran Smith right behind him, both in that heat and in the overall finish order. Schlicht has been a little faster than his prelims time, while Andrew and Smith both dropped from seed. Smith had a stellar freestyle leg, erasing a big lead from the other two. Michigan’s Charlie Swanson, an A finalist and 6th-place finisher last year, missed scoring entirely in 20th place. As a team, Cal puts 3 in the A final. Texas, Indiana and NC State have no scorers in this event. Indiana’s Vini Lanza and NC State’s Coleman Stewart battled for the win in heat 6, putting up the two fastest times of prelims and the only two swims under 45 seconds. Lanza was 44.68, a tenth off his time from finals last year and almost exactly what he went in prelims a year ago (44.66). He’ll make a return trip to the A final. Stewart joins the A final in 44.93 – he won the B final last year with a 44.84 after just missing the championship heat in prelims. Cal’s Ryan Hoffer is the only other returning A finalist, and he and Lanza will both make repeat appearances. Hoffer was 45.04 this morning, using his big underewaters to beat a tough heat. His teammate Zheng Quah qualified for the A final in 5th. In between is Arizona’s Chatham Dobbs, who cut from 45.4 to 45.2 to make the top 8. Florida’s Maxime Rooney is in – he skipped the 200 free, an event for which he’s been known since high school, in favor of this 100 fly, and it paid off big. Rooney didn’t even score in the 200 free last year, and he’ll sit 6th going into finals in this race. Georgia’s Camden Murphy and Michigan’s Miles Smachlo narrowly avoided a swim-off, tying for 7th at 45.31. Both will make the championship final. Cal’s Pawel Sendyk was .06 away from the A heat, and will lead the B finalists tonight. The B final is painfully close, with all 8 swimmers between 45.37 and 45.64 this morning. In the team race, Cal gets 2A/1B. Texas will again go without a scorer, though they’ve loaded up the 200 free with entries. Indiana gets an A finalist. NC State has 1A/2B. That puts Cal at 5A/1B for the morning. IU has 1A, NC State 1A/2B and Texas no scorers yet. It was a brutal prelims of the 200 free, with a deep field crowding some great swimmers out of the top 8 and even top 16. Cal’s Andrew Seliskar paced a fast final heat that accounted for four of the eight A finalists. He was 1:31.64, well off his season-best, but also a tenth faster than last year’s champ Townley Haas went in prelims a year ago. Missouri’s Mikel Schreuders is second at 1:35.15, setting off a chain of athletes in the low 1:32s. Indiana’s Zach Apple is third (1:32.17) and Texas’s Jeff Newkirk fourth (1:32.19) – both came out of the final circle-seeded heat with Seliskar, as did fifth qualifier Paul DeLakis out of Ohio State (1:32.32). Newkirk and DeLakis were the top two qualifiers who improved their personal-bests in prelims today. Newkirk cut seven tenths from his lifetime-best and DeLakis dropped about a half-second. Texas gets three A finalists. Defending champ Haas did only what he needed to win his heat, going 1:32.35 for 6th overall. And freshman Drew Kibler was 8th in 1:32.41, edging out teammate Jake Sannem (1:32.42) for the last A final spot by just .01. Louisville gets Zach Harting into the A final with a huge 1:32.41 swim. Harting had never been under 1:33.1 before. Texas storms back in the scoring hunt with 3 A finalists and 1 B finalist here, their first scorers of the day. Cal gets 1 A finalist, but had what feels like their first bad break so far: returning A finalist Bryce Mefford missed scoring in 17th place. Indiana adds 1 A and 1 B, and NC State put 1 into the B heat. For the morning, Cal still leads at 6A/1B. Texas now has 3A/1B. Indiana has 2A/1B and NC State 1A/3B. Minnesota’s Max McHugh crushed the first circle-seeded heat, becoming the 4th-fastest performer of all-time at 50.30. The time is also believed to be the fastest ever by a freshman, per our quick research. McHugh leads defending champ and American record-holder Ian Finnerty, who was 50.61. USC’s Carsten Vissering is third in 50.68. Those three were widely projected to be the top three finishers, and they could all have a shot to break 50 seconds tonight after doing so on the medley relay last night. Vissering improves his best time by a tenth and moves into a tie for #5 performer all-time. Cal freshman Reece Whitley is fourth in 51.50, still a few tenths off his best time from high school (51.1) and his best time in college (51.3). Indiana will get two much-needed A finalists, as Zane Backes is fifth. McHugh, Whitley and Backes make three freshmen in the top 8 tonight. Georgia Tech’s Caio Pumpitis is sixth at 51.66, and we had another tie for 7th: Evgenii Somov of Louisville and Jordan O’Brien of Missouri both went 51.93, as the top 9 swimmers all cracked 52 seconds. In the team race, Cal gets 1 A finalist. Texas has just 1 B finalist, freshman Charlie Scheinfeld. Indiana gets 2 As, and NC State once again has no scorers, as they did in the 400 IM. That brings our running up/downs to Cal: 7A/1B, Texas: 3A/2B, Indiana: 4A/1B and NC State: 1A/3B. NC State’s Coleman Stewart followed up his pool record medley relay leadoff with an even faster individual swim: 44.06 for the 4th-fastest performance in history, behind only three Ryan Murphy swims below 44 seconds. That came only shortly after Dean Farris took down Stewart’s pool record, albeit briefly. Farris was 44.14 in his heat. Stewart should now be the #2 all-time performer in the event, and Farris the fourth all-time performer and 6th all-time performance. Grand Canyon’s Mark Nikolaev will make the A final in his senior year – he was 10th last season. Nikolaev was 44.91 this morning, still about three tenths off his best from earlier this season. Louisville’s Nicolas Albiero makes a return A final trip in 44.93. That’s just his second time under 45 after going 44.88 at ACCs. Georgia’s Javier Acevedo won the B final a year ago, and he’ll get a shot at the A final tonight – he cut three tenths from seed to go 45.09, though he’s been 44.74 before. And Alabama’s Zane Waddell couldn’t match his top-tier SEC performance, but did maintain his spot in the top 8 with a 45.11 for 8th. All of these results are unofficial though – a potential re-swim was announced. Sources on deck tell us the officials didn’t remove the backstroke starting wedge from the lane of returning B finalist Daniel Carr of Cal, and that he hit the wedge on his turn. Carr finished 17th and Cal currently has no scorers. Getting Carr into a scoring heat would be a huge break for Cal, which has had two rougher events in a row after being basically unstoppable on the preceding 10 events. Update: Carr’s re-swim was a massive, meet-changing swing. Carr went 44.86 to surge his way into the A final after originally qualifying 17th. That swim puts Carr 4th overall. It also bumps Alabama’s Zane Waddell out of the A final and into 9th place, and pushes Texas’s Austin Katz from 16th to 17th. If Carr holds up his 4th seed, he’ll score 15 points after originally scoring none. Katz was projected to score one with his 16th-place finish, but could’ve scored as many as 9 by winning the B final – he was two tenths away from 9th place. Looking at both extremes, this is a points swing of at least 12 in Cal’s favor over Texas (the minimum Carr can score is 11 without a DQ, and Katz loses the one point he was projected) and could be a points swing of as much as 29 (if Carr were to win, he’d score 20, assuming Katz could’ve won the B final for 9 points for Texas. Alabama held their top spot in the 200 medley relay, getting a strong 20.70 split from Zane Waddell on the leadoff to go 1:23.13. That’s still a second off their big-time SEC swim, but did pace the prelims heats by a tenth. Laurent Bams was 23.4 on breast, Knox Auerbach 20.3 on fly and Robert Howard 18.6 on free. NC State is second. They used a slightly off-lineup this morning. Andreas Vazaios was 20.98 leading off, but Coleman Stewart might be a better option tonight after blasting a 44.0 in the 100 back. Justin Ress was also 18.5 on the anchor leg. NC State will probably swim without Jacob Molacek tonight, as he’s swum all three relays so far. Louisville went 1:23.57 for third, getting a 19.97 on fly from Zach Harting. They probably had their best lineup in prelims. They could throw in Nicolas Albiero, but he’d have to scratch the 200 fly tomorrow (where he’s the 6th seed) or the 400 free relay (where Louisville has the top seed), so it doesn’t make too much sense to use him here, coming off a 100 fly/100 back double. Texas and Cal, still locked in a tight team battle, are fourth and fifth. Texas got an 18.7 anchor from Tate Jackson and a 19.9 butterfly out of John Shebat, but also had very safe relay exchanges across the board. Cal had an 18.6 anchor from Michael Jensen and a 21.0 backstroke from Daniel Carr. Texas could swap in Austin Katz on backstroke to potentially improve, or perhaps use Jackson on fly and Daniel Krueger on free. Cal can probably improve the free leg by throwing in Ryan Hoffer (18.6 individually) or using Hoffer on fly and Pawel Sendyk on free. Tennessee is 6th in 1:23.96, getting a 20.0 fly leg out of Braga Verhage and an 18.9 from anchor Kyle Deoursey. Also into the A final: Florida State (on an 18.6 anchor leg from Will Pisani) and defending champs USC, which lost three of four legs but returned breaststroker Carsten Vissering, 22.7 this morning for the best split of the field. In another blow to their title hopes, Indiana finished 9th and will be out of the A final for tonight. They were 1:24.25, using Brandon Hamblin (19.1) on the anchor leg instead of Bruno Blaskovich, who was 18.8 last year. Stay tuned to SwimSwam.com for continuing coverage of today’s diving event (where Texas could add up to three scorers, and Indiana likely a couple as well) and full up/downs, plus scoring analysis and more. 1. Farris rising above meme status to get the AR in the 200 free. 2. Seliskar’s first individual NCAA title in a super impressive fashion. 3. Shebat coming back from injury last season to seemingly be 100% ON for this meet. The thing about (3) – I thought this meet was going to hinge on how “on” Shebat was. Thing is, Cal is swimming so dang well that Shebat is blowing it out of the water and it might not matter one bit. Today is a really good day for Texas in terms of events, and it’s probably the worst day for Cal on that front. With the 2 A finalist divers in probably all 3 diving events I wouldn’t count Texas out at all. Not by that much, overall. Cal 7 up/2 down, Texas 5 up/3 down. If only Shebat was in the 100 fly. Texas might not score in the 100 fly or 400IM today..
Yeah…not sure what event you’d want him to not swim though. His 100 fly last night was super impressive tho. If Finnerty can do the same thing he did last year and drop significant time from his relay to individual we could see a 48 100 breast….